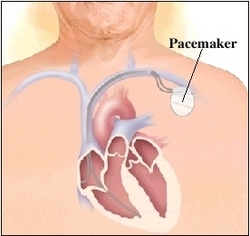 A pacemaker is a small electronic device that helps your heart’s electrical system. It keeps your heart beating at the right pace. Inserting the pacemaker into your body is calledimplantation. You stay awake during the procedure. You may be asked some questions or be asked to take some deep breaths. The lead (transmits to and from your heart) is guided through a vein into your heart’s chambers using x-ray monitors. You feel any of the symptoms you had before the pacemaker was implanted (dizziness, lightheadedness, lack of energy or fainting spells). You have a rapid or pounding heartbeat or shortness of breath. You feel pain in the area around your pacemaker. You have a fever over 101.0 F, or other signs of infection (redness, swelling or warmth at the incision site). You will stay in the hospital a day or two. On the incision side, don’t raise your arm above your shoulder for at least a week. This gives the lead a chance to secure inside the vein in your heart.